What do Custer on a Segway, Arpaio doing a booty dance and an infant in Klan garb have in common? Culture Clash. The satirical troupe is back and taking a magnifying glass to American history. The plot, and oddly enough there is a plot, revolves around the title character, who leaves his pregnant wife in Sinaloa to find a better life for his family in the U.S. In record time, he is studying for his citizenship test, aided (naturally) by Mormon missionaries. But even as he memorizes the sanitized facts he will need to pass the test (name the 13 colonies), his subconscious grasps the larger and more brutal history. Exhausted by study, he falls into an extended alt history dream. From there, the story proceeds with rapid-fire surrealism. The Treaty of Guadalupe-Hidalgo, Lewis and Clark, influenza, etc., etc., etc. The ensemble takes on the less palatable episodes of American history, where Manifest Destiny, racism and paranoia converge. Juan José is played with laconic stoicism by René Millán. He finds the revelations in his dream both informative and disheartening and is the perfect foil for the wacky characters he meets on his journey. As Juan José moves through time, he takes bits and pieces with him. The melding of time frames is particularly effective. When he shows Sacagawea (in orthodontic headgear) her dollar coin, she is unimpressed—“I look fat,” she says. 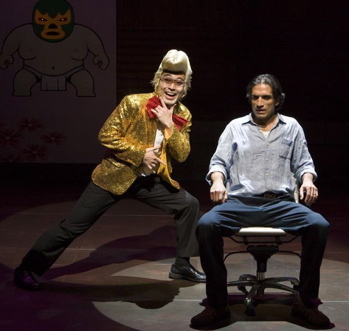 The ensemble is excellent, with standout performances by Stephanie Beatriz, who plays Juan’s wife, Lydia, Sacagawea and many others, and Daisuke Tsuji, who skewers a variety of Asian stereotypes. The set is little more than an empty stage with rapidly shifting projections on a corrugated metal wall. This works just fine, as the scene shifts would task a more traditional set. Bonney’s direction seems to miss just slightly on the early comedic timing, but more than makes up for it in the frenetic closing sequences. With all the hyperactivity of the staging, everything holds together very nicely. Culture Clash sets a high bar for itself and certainly meets it on the comedic side, especially in the last 20 minutes. The social commentary does not quite live up to past efforts, as the group takes on a series of well-documented straw men. No one would argue that Guadalupe-Hidalgo was a good deal for Mexico or that Manzanar wasn’t horrible for Japanese-Americans. However, there are a number of poignant moments, such as a cameo by a civil rights martyr, that give you a feel for the magnitude of under-told barbarity. “American Night” is more fun than revelatory. If the thought of a Culture Clash production makes you smile, you probably already know most of the history. But it’s a worthy effort and a fun ride, start to finish.